If there’s one designer who completely nails perfect holiday attire, it’s Lela Rose. Her dresses and separates are elegant and often embellished, making them the ideal choice for a wedding, holiday cocktail party or other fancy fête. I own a number of Lela’s pieces, probably most notably my favorite floral midi skirt that you’ve seen a few times on here (remember this?). I’ve worn it to weddings, fashion week, and other events where I need to look elevated and extra chic. The main reason I love Lela? all of her pieces look incredible in photos. Even on my phone it looks like a million dollars. That’s what I want out of clothing – I want it not only to look good on the hanger, but also on me and especially when I’m being photographed. 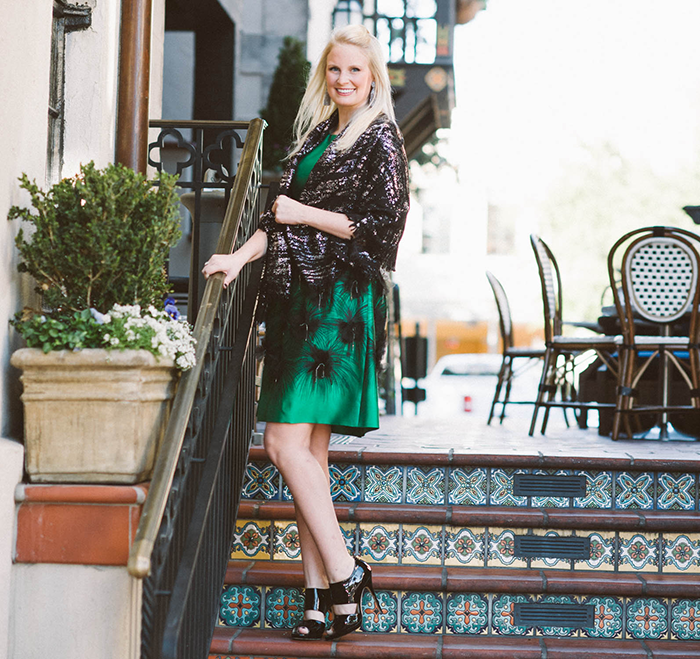 As I know I’ve mentioned before, Lela designs her dresses for a variety of body types – my favorite style is definitely the fit-and-flare (tight at the waist, loose at the hips) silhouette as seen in this green dress, this adorable LBD and this scarlet brocade number. That full skirted, A-line look is universally flattering, but for those with straighter hips, she also does a number of pencil-skirted dresses and simple shift silhouettes as well (like this one and this one!). 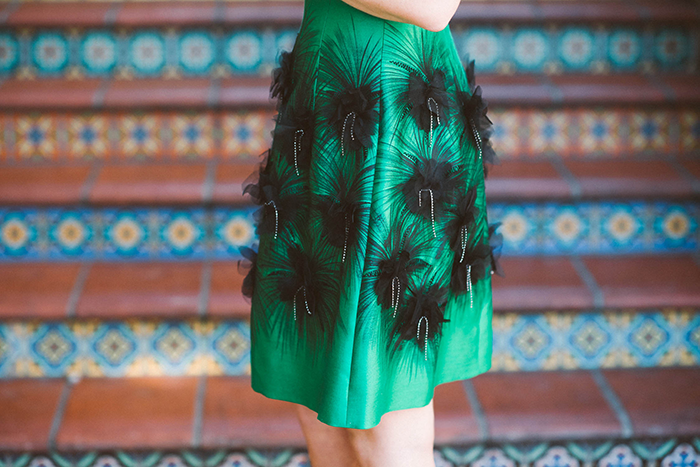 This green embellished number has held my gaze for at least 6 months – it’s from her pre-fall ’14 collection. Isn’t it stunning? The green practically glows, it’s so rich. This dress may just be my favorite piece of Lela’s ever. Also, the Lela Rose boutique in Highland Park Village just received the spring ’15 collection and it is major. Remember this gown? It’s there…and I want it. I highly recommend you stop in if you’re in the Dallas area over the next few weeks! What a stunning dress. You look gorgeous!! Love you in this dress and color. What a fun dress, you look stunning! WOW! This dress is stunning! And looks amazing on you! 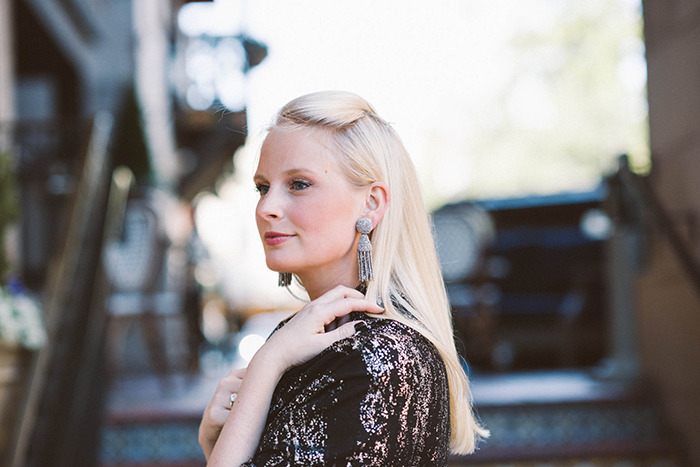 You couldn’t be more right – Lela Rose has the most beautiful holiday wear! This dress is absolutely stunning! The embellishments are just gorgeous and that green color is lovely on you! This dress makes me ridiculously happy! What a fun frock to wear this season! Could you be any more gorgeous!!! Love! What a gorgeous dress and earrings! This is perfect for the holiday season. The color and details of this dress are exquisite! And I love your hair today! Gorgeous pics! This dress is so freakin cool! The emerald color and fun embellishments are amazing! The dress is AMAZING. Unique and chic but classic enough to wear for so many holiday seasons to come!! LR always has amazing fabrics and the craftsmanship is incredible!! Love the green on you and your hair pinned back like it is!! Seriously gorg!! That color green is absolutely gorgeous on you!! And what a lovely dress! So perfect for the holidays. What a stunner! The detailing on this dress is incredible. This dress is stunning and the color is beautiful on you! You look fab! That dress screams holiday cocktail party – I love it! You look stunning! This is so perfect for the holidays!! This dress is incredible and the color is gorgeous on you! So gorgeous Merritt! You look great, green is definitely your color! Work it girl! Green is your color! You look stunning Merritt. That dress is SO flattering on you. Love your accessories too. You totally knocked this look out of the park. This whole look is just so fabulous! That green color is amazing! you look great, and your skin is flawless!! !